With the sun in Cancer (emotional responsiveness) and the moon in Gemini (curious and cerebral), today and tomorrow are Knight of Cups days. The tarot Knights are all movers and shakers – always mounted on their steeds. They all have places to go albeit some will get there faster than others. The Knight of Cups is in no particular hurry. He is a sensitive man. His head full of romance and chivalry, he’s an adherent of all things creative – you’ll find him writing poetry or attending a play. Although he’s intense, he approaches life at a slower pace than usual – the old-fashioned way. However don’t take this mean he’s particularly dependable in matters of marriage or long-term relationship. Never once forgetting ambition to take pleasure in every type of relationship, the Knight of Cups is more of a Don Juan than a family man. 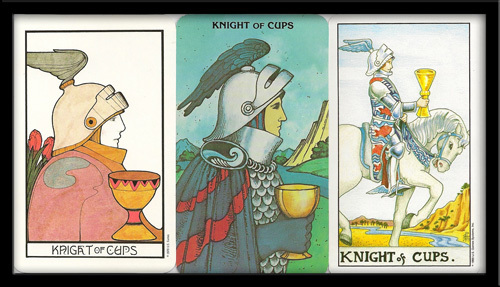 So on a Knight of Cups day, explore and enjoy – savour your encounters like fine wine. But don’t get your hopes up for anything permanent. Although the energy is poignant – perhaps even impassioned – it’s likely that anyone new to your life now is just stopping to smell the roses before they move on. I can feel my energy is markedly different. Thanks for the explanation. Next article Mars in Libra – Might Debate & Indecision Give You a New Lease on Life?